A personal budget is a statement of the amount of money needed to meet your eligible social care needs. It allows you (or your representative) to control the financial resources for your support and the way the support is provided to you. You may be entitled to a personal budget from your local authority. This will be subject to an assessment by your local authority's social care department. 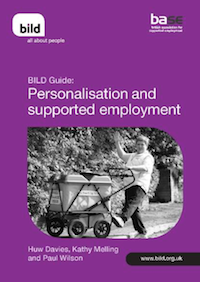 BASE does not believe that personal budgets are the best way to fund Supported Employment but they can be a useful tool for buying employment support from a self-employed job coach where there is no other quality provision available locally. We've written a pamphlet about personal budgets and Supported Employment and you can buy this for £2 from the BILD website. Personal budgets can be given as a direct payment to you or they can be managed on your behalf by the local authority or another contracted agency. You may be responsible for paying employers PAYE contributions if you employ staff. Sometimes the local authority can manage this on your behalf. In Control has a range of support services around personal budgets, including how to request an assessment. In Control has worked with the The Council for Disabled Children to produce a factsheet for people under 25 years. Disability Rights UK also has a range of information about personal budgets.